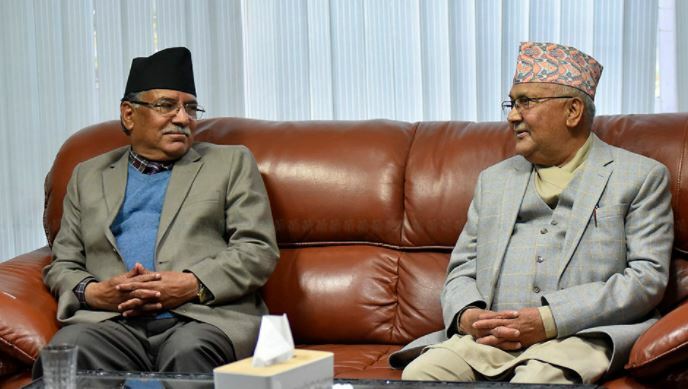 Kathmandu –Prime Minister KP Sharma Oli and Communist Party of Nepal (CPN) chair Pushpa Kamal Dahal 'Prachanda' today have held discussions on issues relating to the merger between the sister wings of then CPN (UML) and CPN (Maoist Centre). The PM Oli is also the chair of the CPN. The meeting held at the official residence of the Prime Minister Oli at Baluwatar in the capital also discussed on contemporary issues. According to the chair Dahal's secretariat, the chairs duo discussed on the progress achieved so far on the merger process between the sister wings, provincial, district and other local committees of then parties. The both chairs agreed on calling the party secretariat meeting on September 12 to finalize the unification bid. The meeting also held review on the chair Dahal's recent visit to India.